Thoughts of a Closet Recluse: Why I cried over Phil Hughes. Why I cried over Phil Hughes. I saw a wonderful tweet yesterday. It summed up what I myself couldn't verbalise when I stopped, like almost every other person - cricket-lover or not - in my tracks at around 4pm on Thursday afternoon. The tweet read: "(I've) never been so overcome with sadness about someone dying that I didn't know." To me, that's just it. I wasn't a friend or family member of Phil Hughes. I never met Phil Hughes. Truth be told, I didn't really know Phil Hughes at all. So as I wallow in a wave of despair, I can't but help wonder why it is I do feel this way. Why am I sad? Why am I crying? Why am I casting aside the expected solemn, strong 21-year-old male stereotype over a man I had no (immediate or otherwise) connection? In my instant surroundings, I don't have a cricket bat or cricket cap to lay against and pay tribute to the marvellous #putoutyourbats campaign. I can’t attend his funeral on Wednesday, and, in light of writing this, I just don’t feel a social media post justifies the weight of emotion that has struck a cord with so many people. I want to more than acknowledge Phillip's death. I appreciate I can't understand his death, but I want to understand my emotions. OUR emotions. Since Thursday afternoon, I set aside my aforementioned stereotype and have openly wept Phillip’s death. Different triggers have set me off. Taking the news in just an hour after a mate had delivered me the reality. Then there were the video tributes. Then the kids being taught the significance of the happening as they bowed their heads in respect. The photos of Hughes: his unbalanced cut shot, his bashful technique. The young boy who retired himself on 37 on the weekend, saying that he’d “finished Phil’s innings for him”. And then of course; Michael Clarke’s press conference. On Thursday night, the sport of cricket lost one of its own. Teammates had lost a colleage. Opposition had lost a fighter. His family lost a brother, cousin, and son. Young cricketers lost a hero they barely knew existed. There are many adjectives to describe what happened on Tuesday. Freak accident, tragic, devastating, sad. I've got one word for it that I've plucked from the vernacular - fucked. 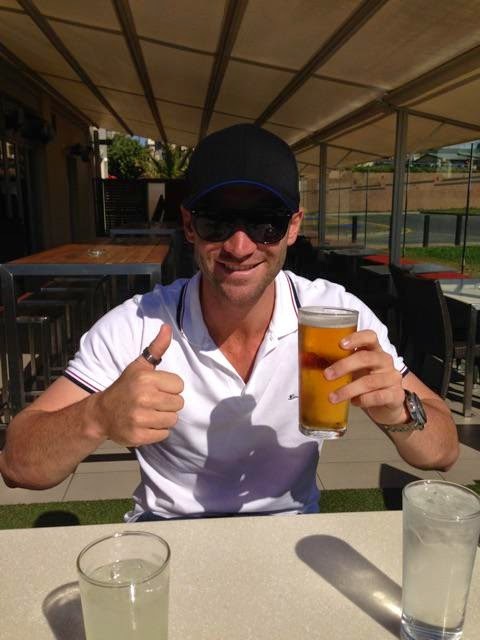 The fact that Phillip Hughes is dead is fucked. As I sat at work on Tuesday one eye on my laptop and the other on my iPhone that streamed the NSW versus South Australia Sheffield Shield match, I witnessed an incident we are likely to never encounter again in our lifetime. The incident is one in a trillion. The incident was one devoid of blame. The incident was exclusive to the fault of bowler, batsman, protective equipment or sport. The incident was an exposé into the dangers of the game of cricket. Cricket – a sport so synonymous with this country and this time of year. Is this why we are grieving so? A young man’s livelihood cut short on the brink of opportunity, as days get warmer, nights get longer and the pot glasses have to be cold when served. Driveways, beaches, parks and backyards, once bare during winter, are engulfed by brothers, sisters, mothers, fathers and grandparents. The cricket bat remains a constant; a tennis ball is swathed in electrical tape to induce swing while stumps range from a dustbin, a tree, a board or set of sticks. Love or loathe the sport, cricket is just synonymous with an Australian summer. A gloom will hang over this particular season as the Hughes family struggles to come to grips with such a tragedy, and I, like many, try to uncover why it has affected me so. In a previous life, I played cricket. I was a fast bowler. I bowled bouncers. I hit batsmen. I hit batsmen in the head. I knocked one batsmen unconscious. As much idolisation as I had for Ricky Ponting hooking balls from in front of his nose with such a ‘bring-it-on’ attitude, I had the same admiration for Brett Lee, who was always the first on the scene whenever he felled an opposing willow-wielder. I can visualize the terror felt by Sean Abbott in that moment shortly after delivering that fatal ball, but I cannot, and will not ever be able to emphasize the longevity of his torment. Rarely does sport accommodate romance and success, for in every one emotion, the opposite is its neighbor. Is it the cricketer in me that has made me cry? Or is it the Australian in me? And before 360 jumps on my back, I do not see nationalism as forming an opinion of racial and religious bias, and my tolerance being concerned by the colour of my fellow man’s skin. My sense of nationalism has laid a foundation for my upbringing and the basis of my interests. On Thursday, one of my fellow Australians died. I did not know him, yet I wept for the sudden conclusion of his cricketing and life innings. People die everyday. People I do not know – should I not be crying for them too? But if not the cricketer, and not the Australian; does my empathy stem from perhaps the fact that I did journey along the realms of professional sport? That I – like Phillip – sacrificed, worked hard, absorbed criticism, acknowledged praise and realised (albeit briefly) my passion as a profession. One of the more peculiar things I heard shortly after Phillip’s passing was Craig Hutchison’s commentary on the New Zealand Cricket team and their refusal to celebrate wickets. Hutchison said the game should’ve been abandoned, for it lacked emotion. Take another look, sir; numbness is an emotion. Emotion is a feeling. The Blackcaps on that Friday, like the rest of us, felt nothing. Like the complexities that surround the value of the number ‘zero’, this was an example of ‘nothing’ being ‘something’. I’ve sat on this piece of writing all weekend, and have come to the conclusion to my inner question of why I have bawled over Phillip Hughes’ death. At the days’ end, it was the humanity in me that caused me to weep. Michael Clarke was at his most vulnerable on Saturday morning as he read words that only he could possibly write. Raw, individual, numbing words. Days earlier, he was vulnerable, but in a different way – quite irrelevant, looking back on it now. Many have said they pulled their car over listening to the press conference on the radio. Others let their tears caress their cheeks watching their television screens of a full-grown man, burdened by the loss of his friend. Clarke’s address ruined the productivity of my Saturday morning. Voting in a state election attached itself to more meaningless, than an existential prison occupant. Clarke’s and many others’ tributes to Phillip Joel Hughes, have given us many insights to a man we didn’t know enough of. What we knew was what we saw. Enigmatic, unorthodox, but nonetheless talented. What we didn’t see, we now realise. Possessive of values that could be in a textbox of successful living. Unassuming, non-complaining, empathetic to the plights of others, hard-working, family-oriented, a man who never forgot where he came from and counted himself blessed as to where he was going next. And that, my friends, is why I cried over Phillip Hughes’. In five days of his death, he has reaffirmed so much that can be good if you maintain the virtues of patience, empathy and hard work. Life is too short for complaint, negativity and self-deprecation. Phillip Hughes was an excellent cricketer, but no longer will we see what we so desperately wanted to see him accomplish on the cricket field. But Phillip Hughes was an exceptional human being and, although he may not know it, an exemplary philosopher. Not one for words, only actions. That much, is eternal. Like the official scorecard from that abandoned Shield match, Phillip’s memory will never be dismissed. Born by love, shaped by ignorance.